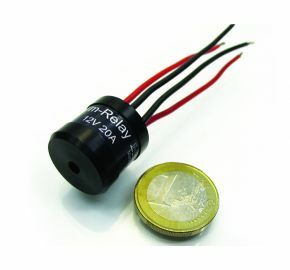 The m.Relay is a very compact relay able to operate numerous functions. High or low beam, horn, ignition etc. can be switched easily and almost loss-free. Higher current loads are put closer to the consumer (e.g. lights). Ignition lock and/or handlebar switch only have to bear a minimal pilot current load. Failures and burned contact pins are a thing of the past! Due to minimized conductor loss, e.g. beam brightness is significantly increased - additional safety! A central threaded hole on the upper casing surface allows for easy installation to any place, even if mounting multiple m.Relays. The m.Relay casing is machined from a solid aluminum block and anodized black. It is completely water-tight and vibration resistant.